The town of Berchtesgaden is located in the south-east corner of Germany just across the Austrian border from Salzburg. From 1922 to 1933 King Rupert and his family lived here each spring and fall. 2 Princess Irmingard was born here in 1923; Princess Hilda in 1926; and Princess Gabrielle in 1927. 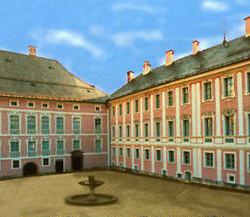 King Rupert had his apartments on the first floor of the baroque wing, while Queen Antonia had her apartments on the second floor of the same wing. The Duke of Cornwall and Rothesay (later King Albert) lived in the Rehbach-Stöckerl in the south-eastern corner of the castle. 3 King Rupert and his family ceased coming to Berchtesgaden in 1933 on account of the proximity of the country retreat of Adolf Hitler. 4 After the war, the family returned to its practice of visiting Berchtesgaden regularly. Several members of the Royal Family were either baptised or married in the Stiftskirche to the left of the castle. In the square in front of the castle is the Kronprinz-Rupprecht-Brunnen (Crown Prince Rupert Fountain) designed by Bernhard Bleeker in 1960. 5 There is a similar fountain in Munich outside the Residenz. In 1923 King Rupert established a museum in the castle; he displayed here many pieces from his personal art collection including paintings, Romanesque and Gothic sculpture, Italian Renaissance furniture, armour and weapons, porcelain, and hunting trophies. The museum can only be visited on a guided tour (usually in German, although one can ask for an English-language pamphlet) which leaves hourly. The tour is perhaps the best means of familiarising oneself with King Rupert's activities as an art collector as well as with the private life of the Royal Family. From the Gothic Hall where King Rupert placed his most important medieval sculptures, one enters the First Weapons Passage (Erster Waffengang), two rooms filled with guns, pikes, and small cannons; here one can see hung on the wall two trophies shot by King Rupert himself (a mountain sheep shot in 1952, and a deer shot in 1954 just six months before his death). The initial "R" (for Rupert) can be seen on several of the guns in one of the glass cases. The two Renaissance Rooms display the most important pieces collected by King Rupert in Italy. From the Lower Fletz one can look into the old kitchen which was last used for the wedding of Rupert's daughter Princess Sophie in 1955. One then enters two reception rooms decorated in Louis XVI style; the furniture in the second of these rooms (the one with pink walls and Rococo stuccoes) comes from Schloss Eiwanowitz. After ascending the main staircase one comes to the former living apartments of King Rupert and Queen Antonia. From the Salon one can look into Rupert's private study. Passing through the Gobelin Room (decorated with tapetries) one enters the Large Dining Room used by King Rupert and Queen Antonia on formal occasions. Next to it is the Small Dining Room which is still used by King Francis II when he stays at the castle today. In this room is displayed a magnificent clock presented to King Rupert by his classmates at the Maximilianeum in Munich. Passing through the Upper Fletz, one then ascends another staircase to the Dean's Gallery (Dekanatsgang). In the corner of this room one can see a bronze bas-relief of King Rupert made by Adolf von Hildebrand in 1908. From the Dean's Gallery one enters a series of bedrooms which were formerly used by the children of King Rupert and Queen Antonia. At the end of these is a room dedicated to the memory of Rupert's grandfather, Prince Regent Luitpold of Bavaria. The Schlossmuseum (entrance €7,00) is only open for fifty minute guided tours. From Easter to October 15, tours leave Sunday to Friday, between 10.00 a.m and 12.00 noon and between 2.00 p.m. and 4.00 p.m.; from October 16 to Easter, tours leave Monday to Friday at 11.00 a.m. and at 2.00 p.m.
Telephone: 08652.2085; webpage (in German) from the Wittelsbacher Ausgleichsfonds (the corporation which manages the King's properties in Bavaria). 1 Cf. Teodoro Bayard de Volo, Vita di Francesco V, Duca di Modena, 1819-1875 (Roma: Spithover, 1878), I, 118 and 139; II, 297 and 340. 2 Kurt Sendtner, Rupprecht von Wittelsbach, Kronprinz von Bayern (München: Richard Pflaum, 1954), 475. They spent the summers at Schloss Hohenschwangau and the winters in Munich at the Leuchtenberg Palais. 3 Irmingard Prinzessin von Bayern, Jugend-Erinnerungen, 1923-1950 (St. Ottilien: EOS, 2000), 30-34. 5 "Historischer Rundgang in Berchtesgaden", http://www.nationalpark-berchtesgaden.de/html/berchtesgaden/kt10.html. Bernhard Bleeker was born at Münster in 1881; he died at Munich in 1968. He completed a number of commissions for the Royal Family. In 1910 he sculpted a bust of King Rupert's grandfather, Prince Regent Luitpold of Bavaria. In 1917 he designed the King Ludwig Medal for Science and Art. In 1952 he sculpted a bust of King Rupert's father, King Ludwig III of Bavaria. 6 Hans F. Schweers, Gemälde in deutschen Museen: Katalog der ausgestellten und depotgelagerten Werke, 2nd edition (München: K.G. Saur, 1994), I, 4, 1968. This page is maintained by Noel S. McFerran (noel.mcferran@rogers.com) and was last updated October 27, 2006.